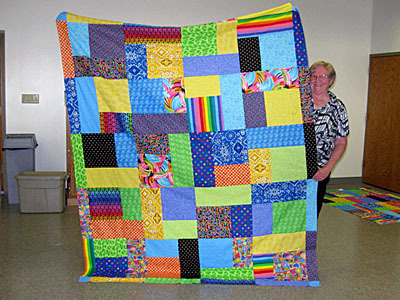 The Friendship Quilters of Ontario (in Ohio) will be giving 12 of these warm and cheerful TURNING TWENTY quilts (with matching pillowcases and new pillows) to foster teens. We had such a FUN day! 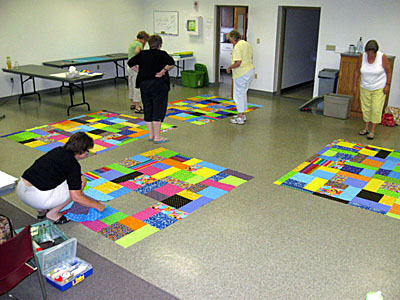 A small group did all of the cutting ahead and put each quilt in a new 18" pizza box. The day of the workshop everyone was handed one with instructions. Several ladies were designated pressers which really speeded things up...one member on backings...one for making bindings. 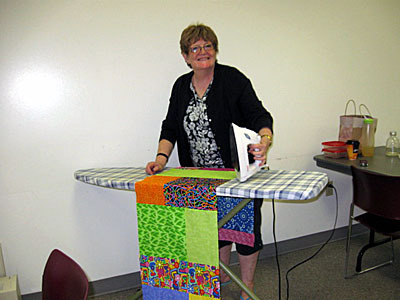 Lots of chattering and laughing (which is typical of quilters!) and don't forget lunch and chocolate! By early afternoon we had all of the tops together! 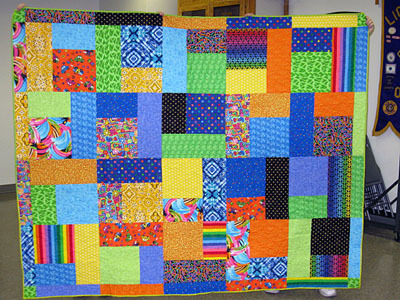 I quilted them as time allowed and then they were passed on for the binding (which was hand-stitched) and labels: "made especially for you by The Friendship Quilters of Ontario, Richland County, Ohio, 2010"
It was a wonderful time and we are all thrilled with the way they turned out...just know the kids will love them! 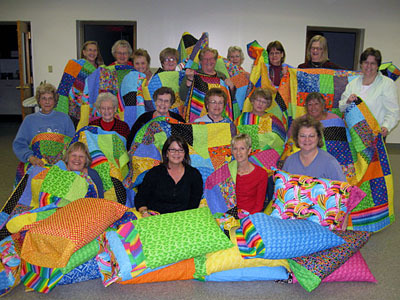 We strongly suggest any group wanting to organize a day like this to use your TURNING TWENTY pattern. It's EASY and FUN and instant gratification! Just look at the photos! 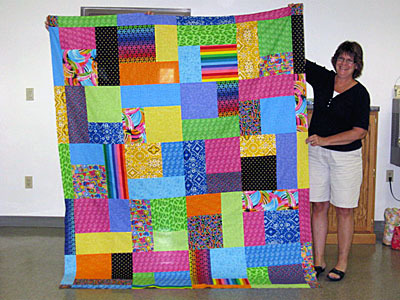 Thank you, Tricia, for being a part of this project by designing such wonderful patterns and for posting this on your website.